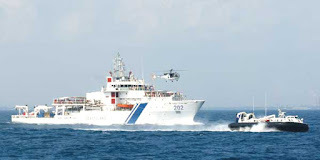 The Indian Coast Guard Ship ICGS Rajkamal and six intercepter boats (C-407, C-412, C-414, C-416, C-417 and C-428) will be rebased to Andaman and Nicobar region as part of Coast Guard Headquarter Rebasing plan. This rebasing plan is aimed towards enhancing the coastal security of the newly established coast guard stations for effective optimization of coast guard assets towards safeguarding the maritime border of nation. Newly commissioned ICGS Arnvesh has already joined the eastern CG fleet as part of replacement. DIF MA Thalha chief of Staff, Coast Guard Region (East) was chief guest for the occasion. Indian Coast Guard Ship ‘ICGS-Rajkamal’, the fourth in the series of eight Inshore Patrol Vessels (IPVs) designed and built by Garden Reach Shipbuilders and Engineers, Kolkata, was commissioned at Chennai by the minister of state for defence Jitendra Singh on 8 January 2013. The commanding officer and men of the rebased ships were given farewell as a customary tradition of service ceremony at Chennai Port Trust Harbour. The ships set course for Andaman Nicobar at 1130 hrs on 25 March 2016 where the Indian Army band played the befitting farewell tunes during the occasion. The CG interceptor boats are being escorted by CG advance offshore patrol vessel Sagar to Port Blair for safe passage.